It may come as a surprise to some that the world’s two leading mobile payments companies aren’t based in Silicon Valley. While a lot of attention has been focused on ApplePay, PayPal and Stripe in the mobile payment race, two Chinese companies have shown the world exactly what a m-payment company should look like. Those companies are AliPay (Ant Financial) and WeChat (Tencent), and although they come from very different origins, they are experiencing a very similar outcome. That outcome is one of grand success, as the two companies processed just under three trillion USD in 2016 and were the number one and two mobile payments companies in terms of total annual transactions (in USD). But what can investors do with this knowledge? Before we get to that, lets turn back to the start of the decade to understand how China’s mobile payment boom came about. In 2010, China’s payment landscape was very different. The nations big 4 banks had pushed hard for the adoption of Credit Cards by the 1 Billion+ population. And to an extent, they succeeded. For every one Chinese person there were 1.8 credit cards in circulation – but strangely enough more than 60% of retail spending was still in cash. Despite the banks best efforts, the population still preferred to transact in physical currency out of habit, perceived efficiency and distrust of the banking system. Over the next few years, there were several transformational changes to China’s economy. The most important was the rapid penetration of smartphone ownership in the country. In 2010, just 6% of all mobile devices in China were smartphones. By 2015, that number had grown to 68%. This can be considered the wildfire that spread the adoption of mobile payment technology in China. Therefore, these next few changes to the Chinese economy were smaller spot-fires that further extended the m-payment inferno. Over the same period, access to internet services in the country increased from 38 people out of every 100 to 50. China’s GDP per capita also grew 31%, from $4,971 to $6,497.8. The countries economy too began reorienting itself; exports fell from 26.5% of GDP in 2011 to 22.1% in 2015, while retail sales grew from 38.6% of GDP to 44.1%. Several things can be inferred from these figures. China had a growing middle class, the majority of which had started accessing the internet and who had more disposable income than ever before. These people didn’t like using their credit cardsand were flocking to smartphones. This caused a perfect storm for mobile payments to thrive in the country. In other words, China’s payments scene was ripe for disruption – so let’s introduce the disruptors. AliPay was founded in 2004, emerging from the online e-commerce giant AliBaba. It quickly became the number one digital payment platform in China, drawing comparisons to U.S company, PayPal. Anticipating strong take-up of Smartphones in the country, AliPay expanded its digital payment platform into a mobile payment smartphone app in 2009. 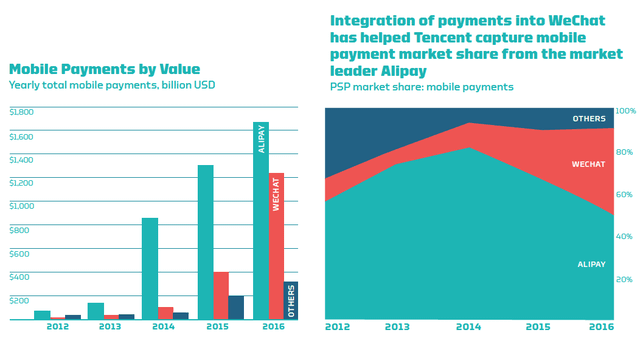 AliPay overtook PayPal in 2013 as the number one digital payment player globally and, in 2016, they processed more mobile payments than any other company in the world with a total annual transaction value of more than 1.7 trillion USD. WeChat was released in 2011 by Tencent as a mobile only social media application. The application swiftly became China’s most popular social media platform. WeChat added mobile payment functionality to the application in 2013, which emerged as the main competitor to AliPay. Between 2014 and 2016, WeChat ate into AliPay’s market share in China as both platforms grew rapidly. During the 2016 calendar year WeChat had over 900 million active users and processed 1.2 trillion USD in total annual mobile payments, the second highest of any company globally (behind AliPay). Since 2012, internet and mobile payments have grown from less than 1% of China’s retail spend to more than 17%. The use of cash in the country has fallen by roughly the same amount. Despite WeChat clawing away at Alipay’s total market share, the two now operate in a stabilizing duopoly, not dissimilar to Visa and Mastercard. At the end of 2016, AliPay had a little over 50% of the mobile payment market, with WeChat (TenPay) boasting a touch under 40%. Their fierce rivalry hasn’t slowed their combined growth and if you want one mind-blowing figure to confirm this – here it is. In 2012, the two companies processed a combined 80 Billion USD in mobile transactions. In 2016, they processed over 2.9 Trillion USD. That’s more than 35 fold increase in just four years, and an annualized growth rate of 145%. As an investor, the obvious way to play this thematic is to simply buy shares in the two companies leading the trend. Tencent is listed on the Hong Kong stock exchange and while AliPay isn’t a publically listed company at the moment, they plan to list in early 2018 – so keep some cash handy. But are investors too late? Earlier, I mentioned there were changes to China’s economy giving this theme a strong macro tailwind between 2010 and 2016. All of these are still in play in 2017 – China’s GDP per capita is still growing. Smartphone penetration and access to internet are both still on the rise. Most interestingly of all, data shows that growth in spending through the apps is outstripping user growth. This highlights that the companies are becoming further integrated into their user’s lives and successfully growing revenue per user. With this in mind, some analysts are even predicting Tencent to become the worlds largest company over the next few years. With record numbers of Chinese tourists visiting Australia, as well as record numbers of Chinese migrants living and studying in the country, entering the Australian payment space would seem to be an easy step for WeChat and AliPay. And it has been. While neither company set up their own payment operations here, they have instead been partnering with Australian financial services companies to do the heavy lifting for them. These companies have been using their own networks to roll out WeChat & AliPay into Australian businesses – and in return they’ll take share of the transaction fees. So let’s meet some of these companies. The most notable is The Commonwealth Bank of Australia (ASX:CBA), who partnered with AliPay in 2016. 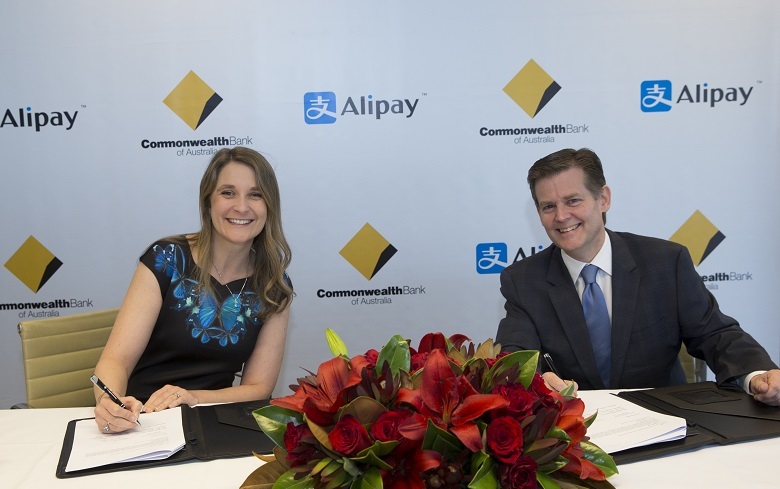 CBA will offer AliPay as a payment option through its Albert tablets, which have a large footprint across small Australian businesses. For now, this will only make up a tiny fraction of CBAs revenue meaning it won’t give investors much exposure to WeChat and AliPays success, so let’s keep looking. The real winners here will be smaller entities offering a payment gateway to WeChat and AliPay and who have been granted a license from either of the two giants. Companies like RoyalPay, Paybang & LatiPay are great examples. These are newer companies, set up with the specific strategy of bringing WeChat and AliPay payments to Australia. Unfortunately, they are private companies. So are there are publicly listed companies with exposure? There is – Novatti Limited (ASX:NOV). Novatti has struck up several partnerships in this space including deals with RoyalPay and LatiPay. 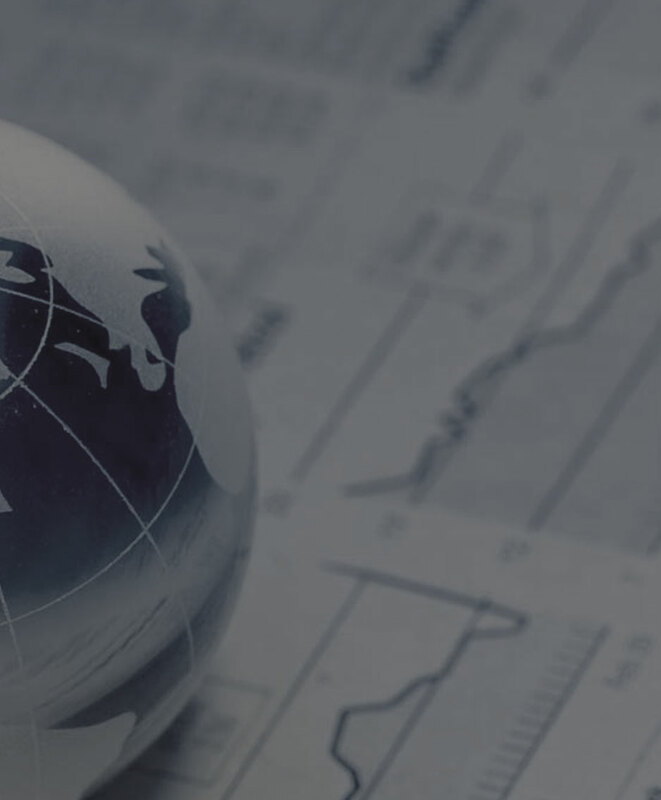 These deals are the backbone of Novatti’s ‘China Payments’ division, which the company reports to have seen strong growth over the past few quarters. Novatti will be one to keep an eye on if they can continue to grow their China Payments arm into a more meaningful portion of their business. Arguably the biggest effect that WeChat and AliPay are having on Australia is the acceleration of ‘daigou’ – Mandarin for ‘buy on behalf of’. Daigou are shoppers based in Australia who take orders from Chinese customers for products that are hard to come by in China – such as milk products, vitamins & infant formula. WeChat in particular has accelerated daigou trade. The daigou can easily set up online stores and communicate with Chinese buyers through the app. Daigou have proven to be the key to a China-focused strategy. NZ Herald Business Writer, Christoper Neische, summed it up brilliantly in his article titled ‘Aussie business ignore Chinese daigou trade at their peril’. In the article, a contrasting example is given between Bellamy’s Australia – who tried to cut the daigou of from their sales chain, and A2 Milk, who instead targeted daigou with their sales strategy. A2 went as far as designing specific marketing materials which could be posted to daigou’s WeChat accounts, helping them sell back to China. As a result, the A2 share price (green) has posted significant gains, while Bellamy’s (red) stumbled in the back half of 2016. All of this being said, the China trade/daigou theme is well understood by the Australian market and there have been many stocks that have seen a stellar run on the back of it, shown below. The daigou/China trade theme is continuing to be accelerated by WeChat and AliPay’s takeup in Australia. As a result, I see AuMake as a potential winner. AuMake is currently vending into the shell entity Augend Ltd (ASX:AUG), a former mining services company – announced to the market on 30th of June, 2017. AuMake’s is a retail business with growing number of ‘AuMake’ branded stores in Sydney. They also operate an online sales platform and warehouse facilities to complement the retail business. AuMake sells a range of quality Australian products in its stores and online, specifically targeting the Chinese community and in particular, daigou, who will then on-sell the products back to China. While information is scarce at this point in time, AuMake seems to be a pure-play exposure to the daigou theme and I look forward to seeing how its listing plays out. All figures in this article are from a case study released in April 2017, titled ‘Social Networks, e-Commerce Platforms, and the Growth of Digital Payment Ecosystems in China: What It Means for Other Countries’, by the Better Than Cash Alliance. The Better Than Cash Alliance is a partnership funded by the Bill & Melinda Gates foundation and several financial services companies (including Visa, Citi & Mastercard). The members include over 50 governments and companies who are aiming to accelerate the transition from cash to digital payments in order to reduce poverty and increase growth. Other figures presented have a hyperlink to the source.